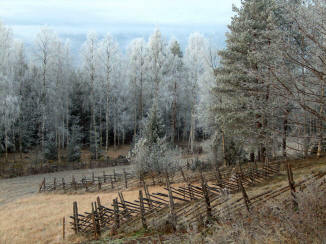 The farm nowadays called Harju was established in 1675. At present the total area of the farm is 37 hectares, out of which 31 hectares is managed as traditional rural landscape with subsidization from the European Union. The present main building was built in 1855. You can still see the main room almost in its original exterior: the very old log walls, the carbon-black ceiling and the half a metre broad planks of the floor. 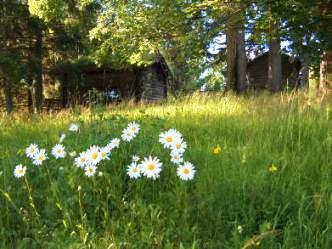 The meadows and forest pastures of Harju have been classified as a nationally valuable traditional rural biotope and landscape area. Over a period of 400 years the grazing has made the flora of the pastures exceptionally varied. We have discovered and photographed about 300 vascular plant species on the area of the farm, including two nationally endangered and seven regionally threatened species: Daisy-leaved Moonwort (Botrychium matricariifolium, EN), Lance-leaved Grape Fern (Botrychium lanceolatum, VU), Leathery Grape Fern (Botrychium multifidum, RT), Moonwort (Botrychium lunaria, RT), Field Garlic (Allium oleraceum, RT), Frog Orchid (Coeloglossum viride, RT), Coralroot Orchid (Corallorrhiza trifida, RT), Wall Lettuce (Mycelis muralis, RT), and Club Sedge (Carex buxbaumii, RT). In Finland Field Garlic is considered a sign of a very old settlement. 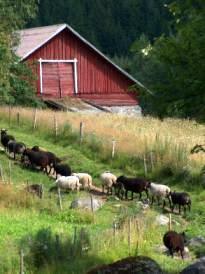 Harju has been an organic farm for more than 30 years. The Finnish breed sheep of different colours produce meat but also help to maintain the traditional landscape and biotopes with their grazing. Marja Mattlar, the lady of the house, is known as a singer-songwriter. She has published numerous music albums and a concert of hers can be arranged in the old main room during your visit on Harju. The master of the house, Tapio Mattlar, is a member of a folk music band called Ancient Bear Cult. You are welcome to visit the Harju farm! It is located in Southern Finland on the eastern side of lake Päijänne, 220 km northeast from Helsinki. A guided excursion on the farm to see the numerous plants is possible in June–August period. We can guide you in English or Finnish and tell the English, Finnish or scientific (Latin) names of the plants. The concert of Marja Mattlar can be arranged at any season. Please, contact us if you are interested in a visit!